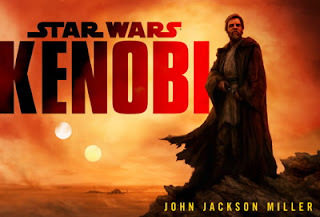 Faraway Press: The Online Home of John Jackson Miller: Preorder Star Wars Kenobi now! Preorder Star Wars Kenobi now! I've been exceptionally busy putting the finishing touches to Kenobi this month — but I can pass along that the title now has a page in the Random House catalog, and that means it can now be preordered. Click here to preorder Kenobi from Amazon. And here's the page to order from Random House directly. Links for Barnes & Noble and other outlets will be added as they become available. The date in the catalog if September 24, which as always with these things, is subject to change — and the page count is a placeholder that is very likely to change, given the length of the book. Actual cover art and more details coming one of these days. In the meantime, back to proofreading! Will we be getting an audio book? If so we need James Arnold Taylor to read it.